Note: 190-sereis II comes with USB-port and USB-cable included. For 190-II no additional hardware is required. Documenting: Transfer screens, waveforms, and measurement data from the ScopeMeter to your PC for printing, or to import data to other programs. Archiving: Store and retrieve waveforms with text annotations and create your own library for easy reference and comparison. Analysis: Gather valuable measurement data and enable cursor measurement to reveal relationship and conditions. Extended recording of up to four user-selected measurements help you monitor and analyze slow moving signals and related events. 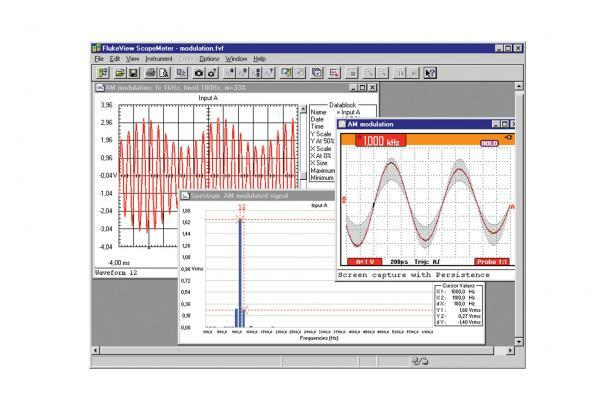 Upload waveforms to the PC and use cursors for detailed measurements. Perform waveform analysis, inlcuding analyzing harmonics.